The Eurasian Economic Union (EAEU) is a customs and economic union of Belarus, Russian Federation, Kyrgyzstan, Kazakhstan, and Armenia. Since 2015 the EAEU is the legal successor of the former Eurasian Customs Union EACU. In the area of the Eurasian Economic Union applies a common customs tariff, unified trade rules and harmonized technical standards. The products, which conform to all technical regulations and this is confirmed by a EAC certificate, are allowed to cross the borders and be sold within the EAEU. This requires no further national certification of conformity such as GOST-R, TR or GOST-K. The legal basis for the EAC certification involves the board decision of the EAEU commission No. 319 from 18.06.2010, the agreement on common principles and rules of technical regulation in the Republic of Belarus, Republic of Kazakhstan and the Russian Federation 18.11.2010 , and the decision of the board of the customs union commission No. 620 from 07.04.2011. As a consequence of the harmonization of national safety standards, the previous national technical regulations such as Russian GOST-R, and TR certification were gradually expired and substituted by the new technical regulations of the EAEU - TR CU in every industrial sector. In addition to the EAC certification, the EAC declarartion has also been introduced in the Customs Union as a simpler and more favorable form of proof of conformity. The EAC certification process is common for all member states of the EAEU. The certificate of the EAEU has a standard form and application process according to the board decision of the EACU commission No. 896 from 09.12.2011. The EAC certificates of the EAEU applies in all member states within the EAEU and are valid up to 5 years. The issued EAC certificates are registered in the uniform register of the EAEU. Besides the duties of EAC certification one needs the EAC declaration process to confirm the conformity of the products with technical regulations of member states of the EAEU. The EAC certification and EAC declaration are required for all products, which are listed in the common list of products to be certified within the EAEU under decision of the board of the eurasian economic commission No. 620 from 07.04.2011. For the products, which are not listed, the national regulation for the certification for import and sales is valid. The complete list of products, which require EAC certification, you can find here. Depending on the type of certified products you may provide other additional documents. In case the products, which are to certify, also require hygiene and sanitation control, you may provide appropriate proofs for the issue of the EAC certificate of the EAEU. The EAC declarartion of conformity to technical regulations of the Eurasian Economic Unionis is one easy and cheap way to prove the conformity of the products. It should guarantee that the products meet the safety requirements of the technical regulation of the EAEU, are safe for customers and the environment. In opposition to the EAC certification, the EAC declaration can only be applied by an importer based in one of the member states of the EAEU. Therefore an authorized representative within the EAEU is required. If you need an authorized representative, we will be pleased to offer you a suitable company that takes over this function. The EAC declaration has the equal validity as a certificate. The products listed in decision of the board of the customs union commission No. 620 from 07.04.2011 from 07.04.2011 require a EAC certification or a EAC declaration. The terms and the costs associated with an EAC certificate application, depend on several different factors, such as the classification of product, any required laboratory checks and complexity of all examinations. As such the exact conditions of the EAC certification are always determined individually based on the required documentation. Please note that an application for an EAC certificate can take from a few days, to a few weeks to process. Please find detailed information about our prices for EAC certifications here. If you order an EAC certificate, you will receive a copy of it via email immediately upon our successful EAC certification process. Alongside the original document and two certified copies of it by post, within a few days’ time of this. The products listed as ones who require EAC certification under the technical regulation of the EAEU need to be marked with EAC mark of the EAEU. This proves its conformity to all legal requirements of the EAEU. The requirements to EAC marking and its conformity to the technical regulation of the EAEU are listed in the decision of the board of the customs union commission No. 711 from 15.07.2011. 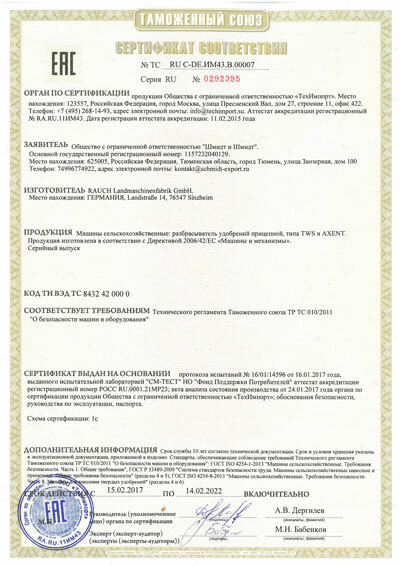 The marking of products, which require an obligatory EAC certification under the technical regulation of the EAEU, is one condition for admission to the market. The placing on the market without appropriate marking is forbidden. Moreover, the EAC marking increases the trust of potential customers and the demand for the product. Our goal is the establishment of mutually beneficial business relations with our clients and partners. We offer: EAC certificate for series production with its validity up to 5 years from 900 €! Require an EAC certificate offer here! Please call us or send us an email. We will provide you with a free, non-binding quote and will be glad to answer all your questions about EAC certification of conformity to technical regulations of the Eurasian Economic Union! Convince yourself of the quality of our services!